We're offering single Gotoh SG381 tuners in right and left handed options to let you build custom sets for your guitar, for example pair 1 tuner with a 6 in line set to get a 7 in line set or pair it with a 3 x 3 set to get 4 x 3 etc. The orientation is in reference to a standard 6 in line set, so a right handed tuner would match a 6 in line right handed set, a left handed tuner would match a 6 in line left handed set, and a right handed player with a reversed headstock would need a left handed tuner to add to a 6 in line set. 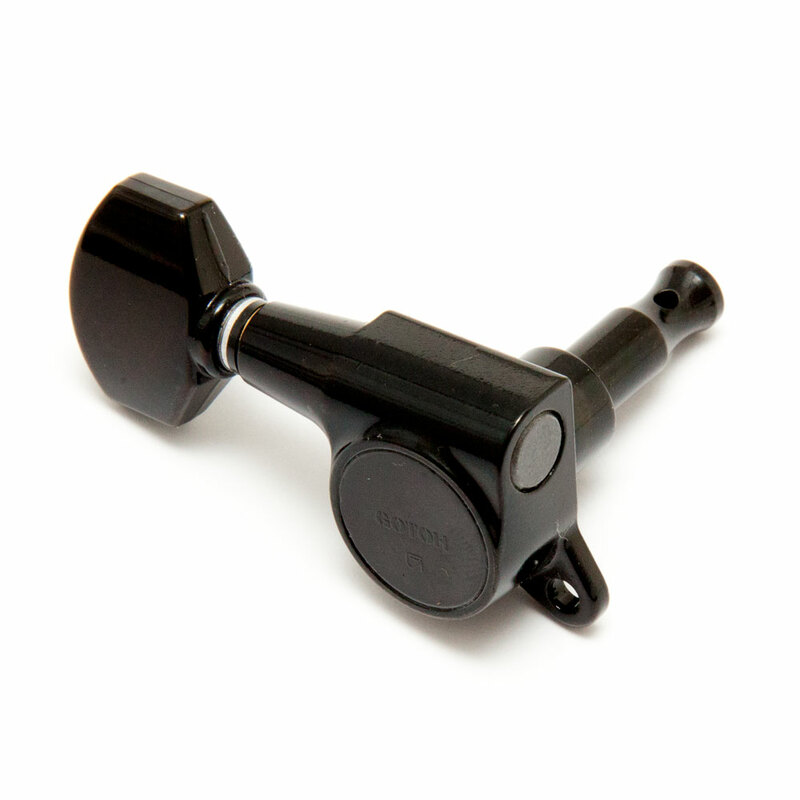 The Gotoh SG381 tuners feature a 1:16 gear ratio for tuning up quickly and accurately. The 'Rock-Solid' string post improves the tuning stability of the tuner and stays strong during bending and tremolo use, special elastic parts eliminate any rattle in the post and transmission of string vibration to the instrument is maximised. The tuners are completely sealed and permanently lubricated through Gotoh's 'Lubri-Coat' technology, a coating applied to the worm gear to ensure better contact between the worm and spur gear wheel, backlash is minimised and durability is increased. These tuners have the screw attachment holes offset at a 45 degree angle to the tuner post, this set up is common on a lot of headstock designs from Ibanez, Schecter, ESP/Ltd, Jackson and PRS SE guitars.